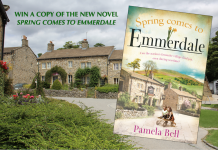 EMMERDALE EPISODES: The past comes back to haunt the villages as Robron find themselves at the scene of their first kiss – will Robert or Aaron finally pop the question? 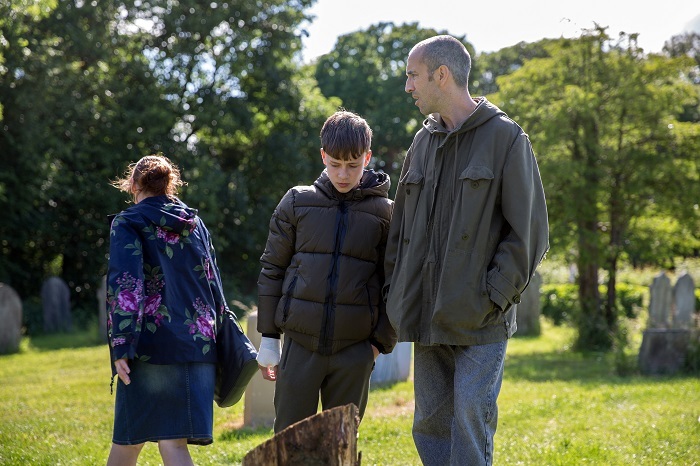 Graham is haunted by the ghosts of his past causing him to lash out at those closest, while Sam struggles as he debates telling Samson the truth about his mum’s death. 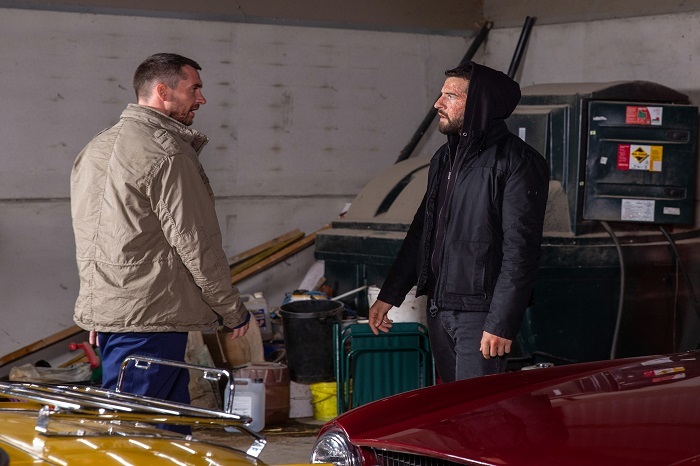 There’s a health scare for Lydia and a scare of a different type for the Barton brothers as the police close in on the barn of Lawrence White’s classic cars. 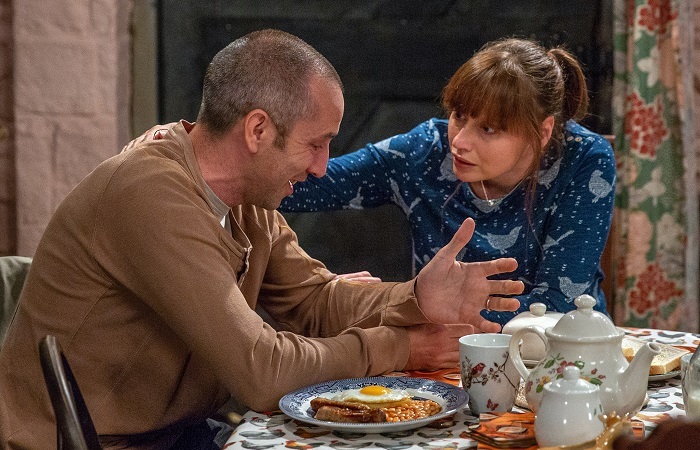 Mon 30 July 2018: A devastated Sam Dingle tells Lydia that he helped Alice to die. 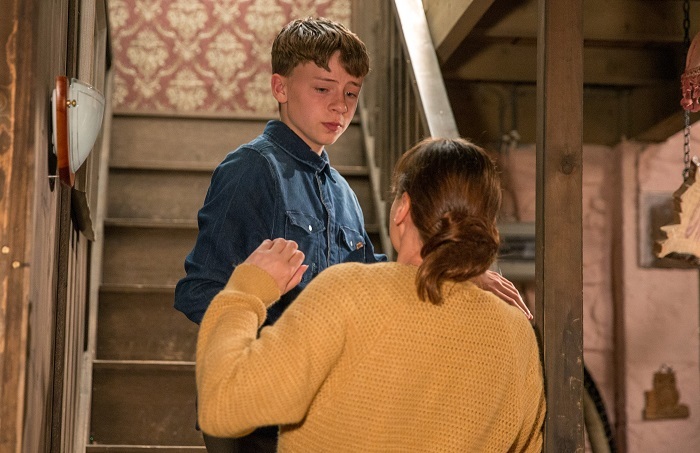 Mon 30 July 2018: Distraught, Sam Dingle is scared that son Samson will find out what he did. 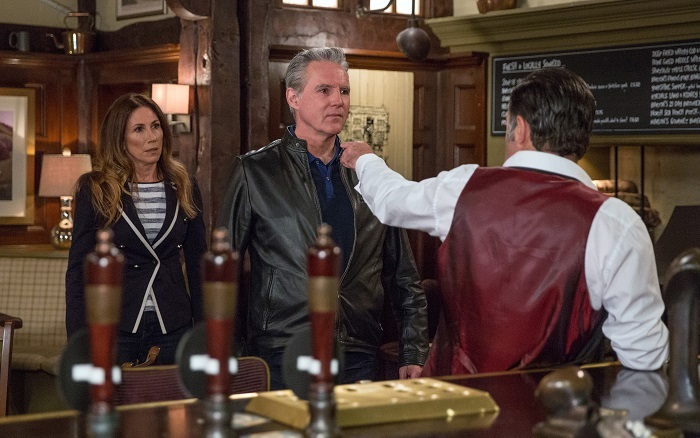 Tues 31 July 2018 – hour long episode: Haunted by memories and mistakes, the viewers will visit Graham’s past. Tues 31 July 2018 – hour long episode: Viewers will at last see what has made Graham Foster the man he is today. 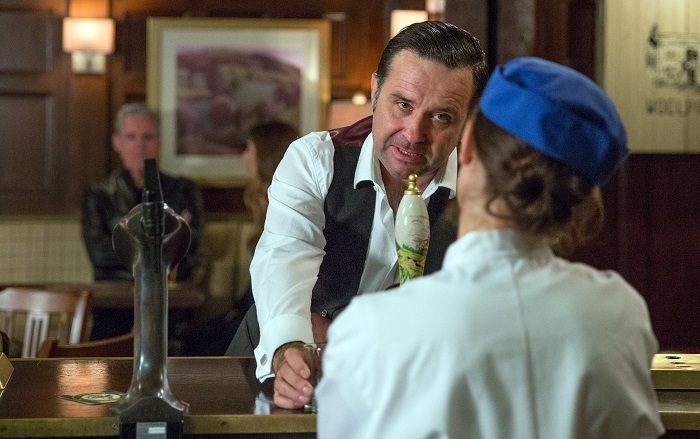 Tues 31st July 2018 – hour long episode: In the village Graham Foster is drunk and out of control. 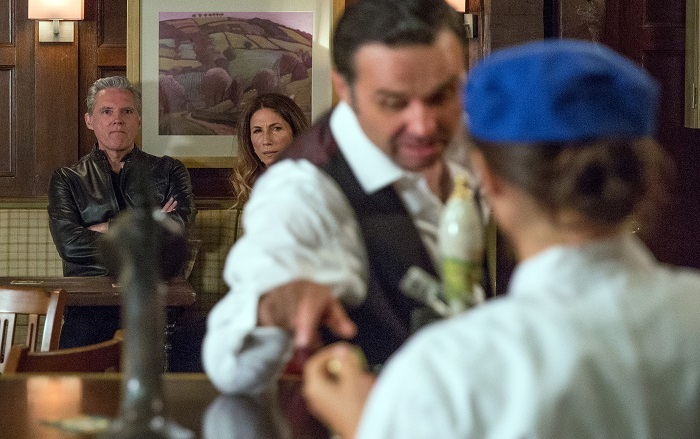 Tues 31 July 2018 – hour long episode: Frank Clayton tries to intervene with Graham Foster. 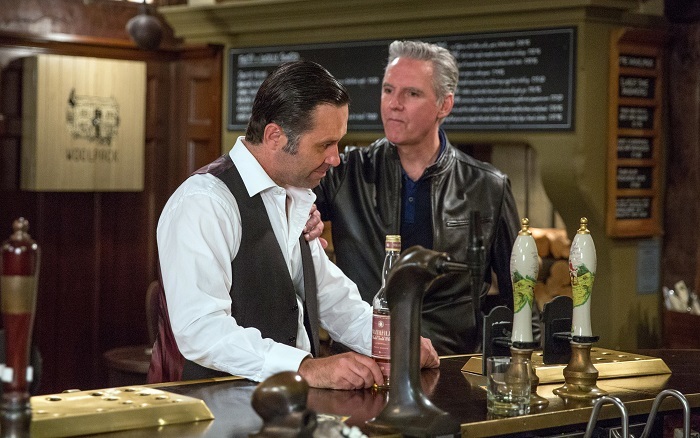 Tues 31 July 2018 – hour long episode: A fight breaks out in the Woolpack as Frank Clayton tries to help Graham Foster. 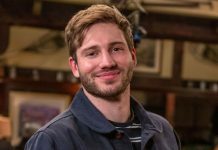 Tues 31 July 2018 – hour long episode: Joe Tate finds Graham Foster and attempts to console him, gutted by the depth of his self-loathing. Tues 31 July 2018 – hour long episode: Graham Foster loses control and charges at Joe Tate. Just how far will Graham go? 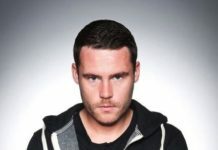 Tues 31 July 2018 – hour long episode: At the hospital, Sam Dingle is anxious as he waits for news on Lydia. 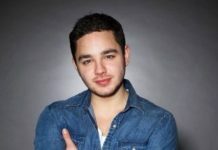 Lydia starts to panic when the doctor examines a suspicious mole on her leg but later covers her worries from Sam. 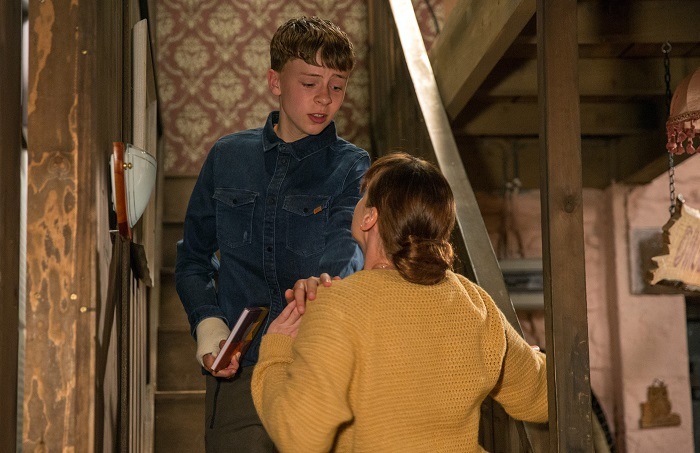 Tues 31 July 2018 – hour long episode: Sam Dingle decides to come clean to his son and tells him the truth. 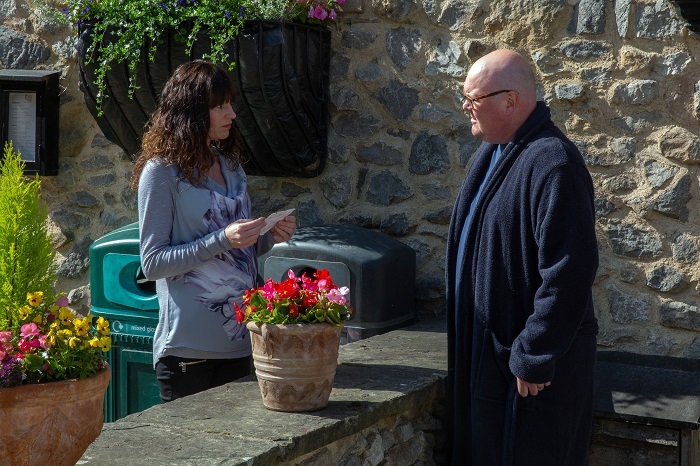 Tues 31 July 2018 – hour long episode: Samson Dingle is shocked and accuses him of murdering his mum. 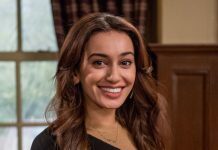 Tues 31 July 2018 – hour long episode: Lydia Hart tries to talk Samson Dingle round. 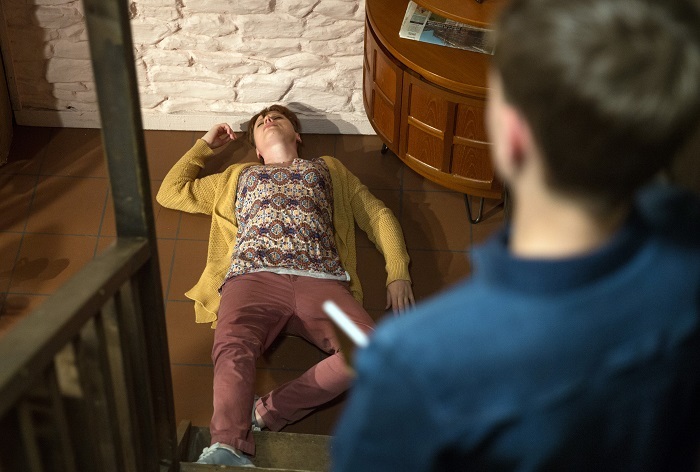 Tues 31 July 2018 – hour long episode: Samson Dingle lashes out and accidentally pushes Lydia Hart down the stairs. 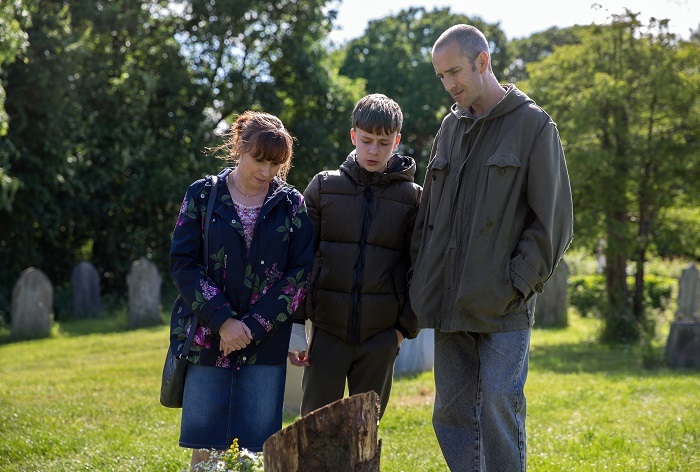 Wed 1 Aug 2018: Sam Dingle and Samson invite Lydia to accompany them to Alice’s grave. 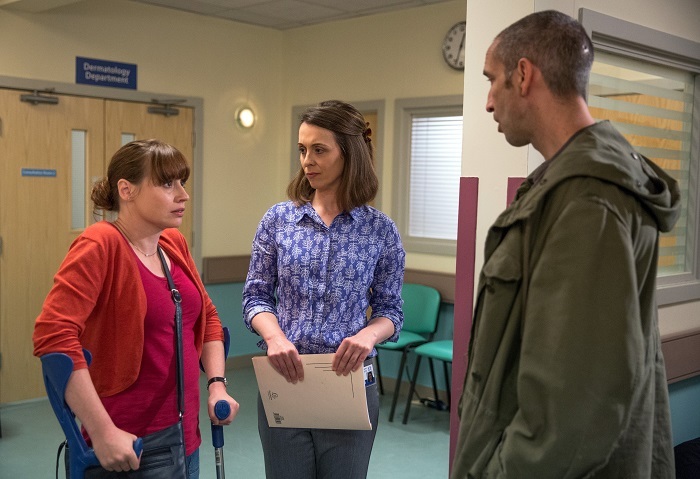 Wed 1 Aug 2018: Lydia struggles when Sam and Samson Dingle talk about Alice’s cancer. Sam becomes aware that something is not right. 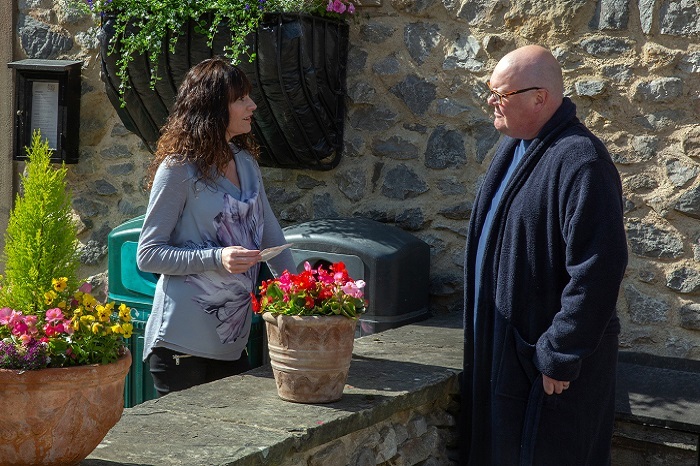 Thurs 2 Aug 2018 – 7pm: Pete Barton searches around Butler’s Barn and gets suspicious when he spots Lawrence White’s stolen cars. 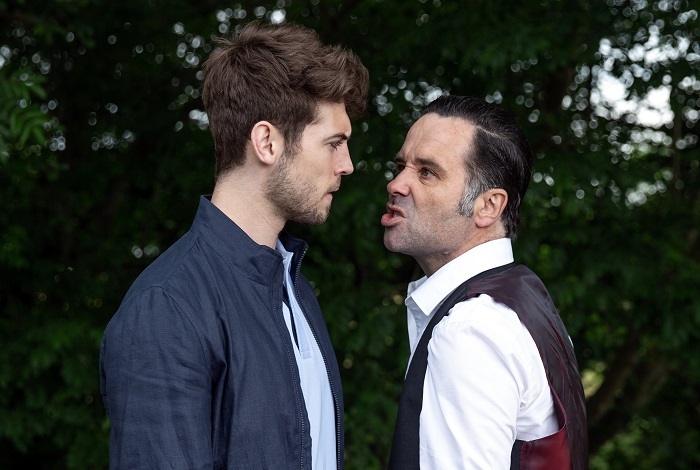 Thurs 2 Aug 2018 – 7pm: Pete Barton confronts Ross but both are rattled when Rhona Goskirk makes her presence felt and demands answers. 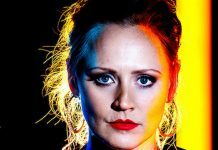 Thurs 2 Aug 2018 – 7pm: With Pete and Ross Barton and Rhona Goskirk in the barn, they are unaware the police are waiting outside. 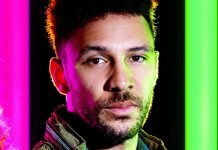 Thurs 2 Aug 2018 – 8pm: Bob Hope agrees to give Brenda Walker the cafe. 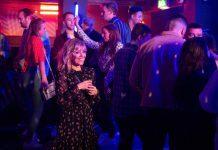 Thurs 2 Aug 2018 – 8pm: Cain Dingle arrives at the garage and clocks on about the cars. 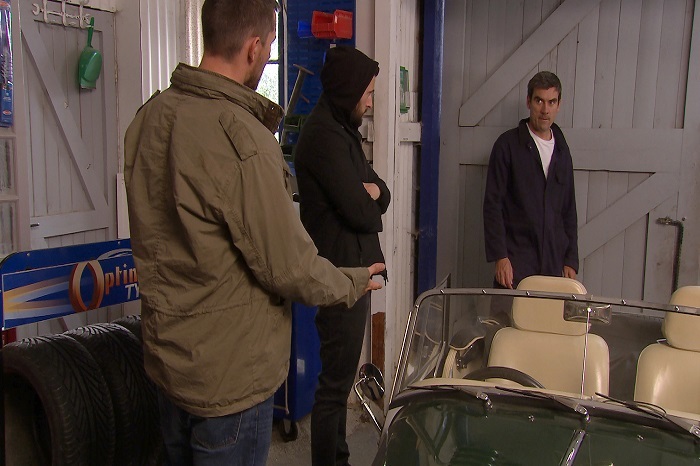 Thurs 2 Aug 2018 – 8pm: Cain Dingle tells Ross Barton and Pete Barton that there is an unmarked police car outside. 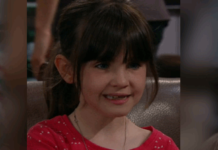 Thurs 2 Aug 2018 – 8pm: Cain Dingle berates Ross Barton for his stupidity. 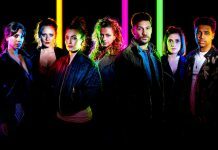 Thurs 2 Aug 2018 – 8pm: Will they find a way to get rid of the police? 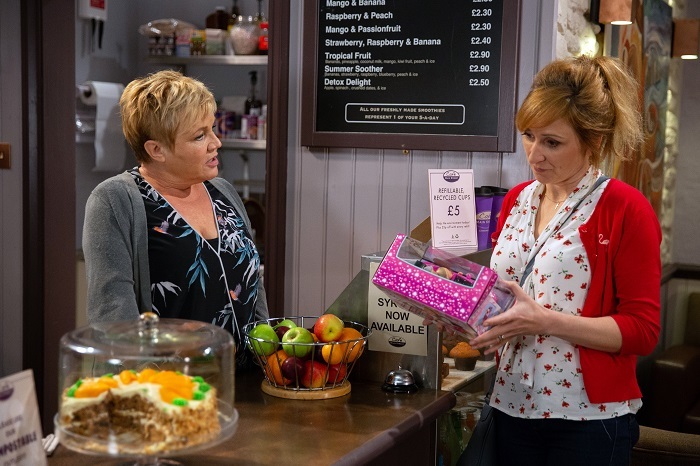 Fri 3 Aug 2018: Laurel Thomas is humiliated when Brenda Walker tells her that Bob doesn’t work in the cafe anymore. 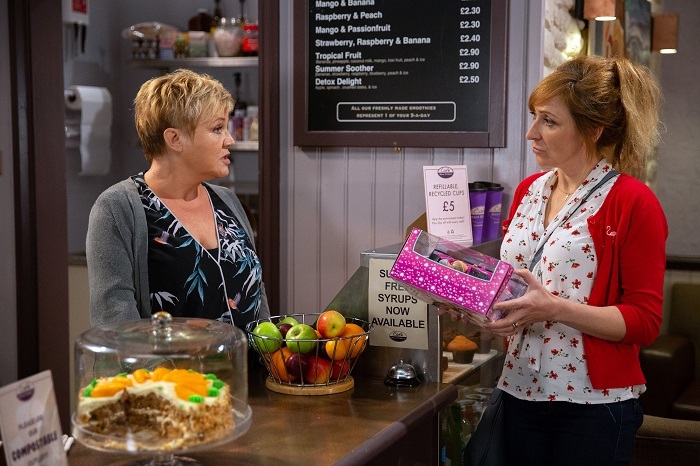 Fri 3 Aug 2018: How will Laurel Thomas react to Brenda Walker’s news about Bob Hope? 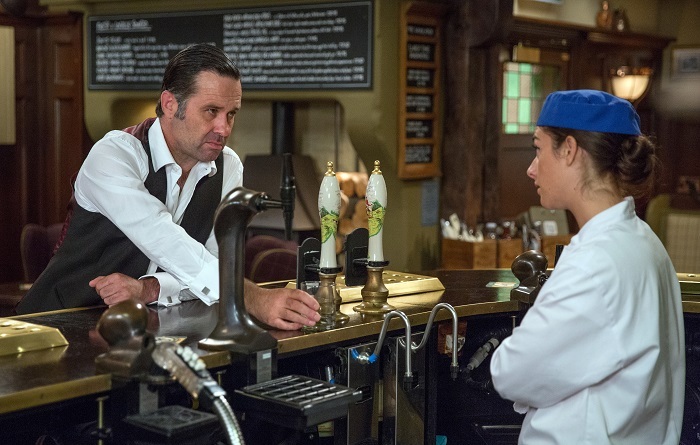 Fri 3 Aug 2018: Chas Dingle and Paddy Kirk decide that they want their baby to have godparents.